I'm a bit late with this post... We are already a week into July. I can barely believe it! Since Plastic Free July is such a great initiative, however, I want to share what our family is up to this month. I have previously posted about how to use less cling wrap. That is a very simple and easy thing to stop using around the home. Our family already takes our own re-usable shopping bags into the shops (well, most of the time! ), doesn't use straws, and uses re-usable water bottles. These items are good ones to start out with when you are beginning to cut back the plastic in your life. 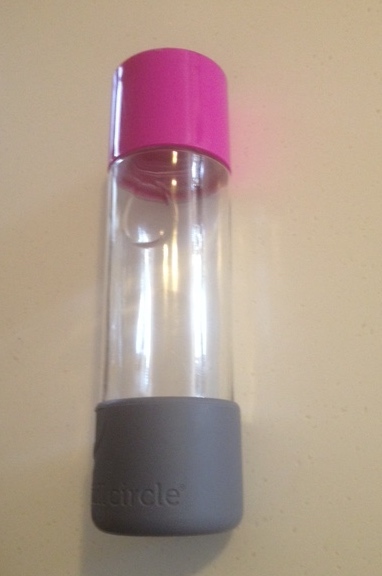 My glass re-usable water bottle. Sure it cost more upfront but I love drinking out of it. Buying more bulk products, such as oats, beans, lentils, sultanas, & cleaning products, by bringing my own containers to be refilled. I have bought myself a reusable takeaway coffee cup (at last!). I rarely buy take away coffee since I feel too guilty about the waste. This is a very exciting purchase since I am now able to indulge on the run. I am saving all of the single-use plastic packets that we finish throughout the month in a (re-usable!) shopping bag. I will review these products each week to see if I can find ways to reduce or eliminate more plastic from our lives. I have spoken to my child care centre about trialling using cloth nappies for Turtle on the day that she goes there each week. They have agreed to trial them this week. If it goes well then we will continue to use cloth at child care in future. Have you already heard of Plastic Free July? Are you inspired to try and reduce your single-use plastic this month? Please share any tips and ideas below.